SeaWorld has come under fire again -- this time for its treatment of wildlife, not its captive orca whales. 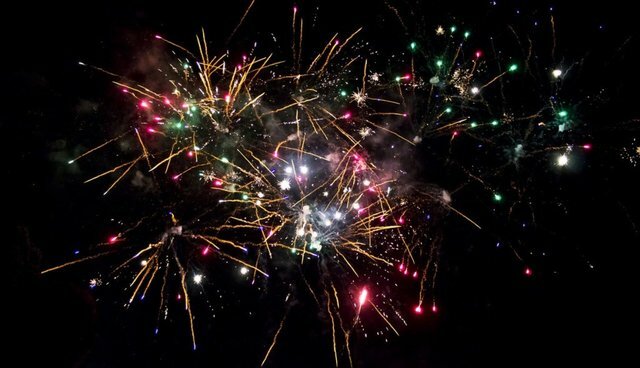 The company's San Diego location, which hosts fireworks displays from March to September, is being criticized for polluting the bay where the fireworks explode, harming the wildlife that live there. The park has 79 firework shows planned for this year, to be held over San Diego's Mission Bay, a saltwater bay that is known to be home to many endangered species of birds. It's well established that fireworks are something of an environmental disaster for wildlife. The chemical reactions that happen to create bursts of color -- strontium and lithium burn red, copper burns blue, magnesium, titanium and aluminum make white sparks, boric acid makes green -- release numerous byproducts, like cancer-causing dioxins. And the gunpowder used to launch them leaves a slew of chemicals behind it as well -- potassium carbonate, potassium sulphate and sulphide, unreacted sulphur and fine particulates. When fireworks explode, the chemicals they give off settle on whatever soil or water they land on. And they have sticking power -- one EPA study of an Oklahoma lake found evidence to support that even 14 hours after a fireworks display, levels of a chemical called perchlorate (a known water contaminant harmful to people and wildlife) were 1,000 times higher than usual. It took up to 80 days for those levels to return to normal. Considering, then, SeaWorld's claim that their company "makes a difference for animals all over the world," the regular fireworks displays over Mission Bay seem at best misguided, at worst reprehensible. Research into the effects of fireworks on wildlife is sparse, but it seems contrary to a conservation agenda to risk contaminating areas that are densely packed with wildlife. SeaWorld has responded to these concerns before -- in 2008, SeaWorld spokesperson David Koontz told SDNews.com that they had "monitored a number of metals and elements and constituents to see if there [were] any elevations in the bay." "It was shown that there was no negative impact on the quality of the bay as a result of our fireworks," he added. However, short-term elevations in chemicals can still be harmful, as Edwin Decker noted over at San Diego City Beat. Just because there aren't dead fish washing up on the shore doesn't mean some seriously bad mojo isn't happening. Also, no mention of studying trends in animal mortality, birthrate, disease, food supplies and habitat destruction? This isn't the first time SeaWorld has come under fire for polluting Mission Bay. It's well known that the park dumps discharge into the bay -- in 2000, documents revealed that SeaWorld's water quality permit was violated eight times within a six month period. In 2012, SeaWorld was cited again for exceeding Mission Bay effluent limits. On its website, SeaWorld says that their guests "leave with a heightened sensitivity to the world around them and an awareness of the plight of animals in the wild" -- a claim that rings hollow, given their own relationship to animals in the wild.